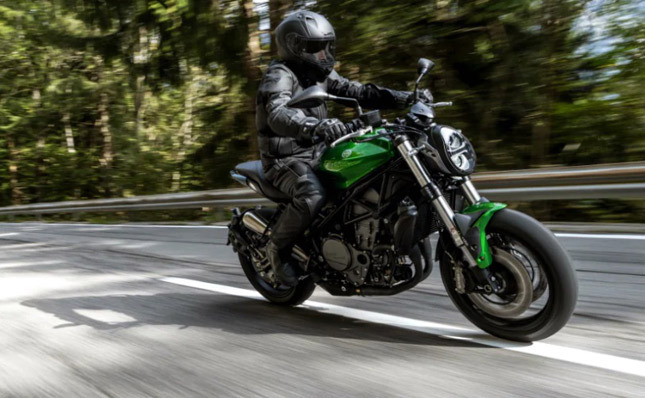 Benelli took the cover off the production model of 752S at EICMA 2018. It is a naked roadster, which will sit above the Leoncino 502. The production-ready 752S features a lot of new equipment and here is a quick look at all of them. Benelli 752S is powered by a 750cc liquid cooled twin cylinder engine producing 81.6 HP at 9000 RPM and 67 Nm of torque at 6500 RPM. The bike is expected to have a linear power delivery along with a flat torque curve. The Benelli 752S is equipped with a steel trellis frame and utilizes 50mm Marzocchi USD forks and a monoshock suspension at the rear. The travel at the front end is 117 mm while the rear suspension has a 45 mm long stroke. The bike uses a 120/70 section tyre at the front and a 180/55 section tyre at the rear, wrapped around 17-inch wheels. Braking is handled by dual 320 mm semi-floating discs up front paired with a 4-piston caliper and a single 250 mm disc at the rear with a single pot caliper. The bike will feature dual-channel ABS for enhanced safety. We reported a few weeks ago that Benelli India is under new management and will release a number of new bikes in the coming years. Next year the company is likely to launch around 12-13 bikes and the Benelli 752S could be one of them. The Benelli 752S features more power and torque than Benelli 600i and it could be a great replacement for it.